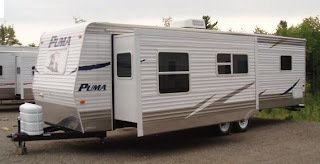 Our RV is a 29 foot travel trailer called a Puma from Palomino. Its model number is the 29 FKSS. For a travel trailer, a 29 footer is pretty big. If you are thinking about pulling it with a 1/2 ton pickup, you would be sadly mistaken. Here is some information and pictures about the travel trailer. Right now, we will be living in it on weekends. We'll pull it to fun locations near Austin Texas (where we work and live) and it will be our weekend machine. We're paying for whole months and leaving it at the sites so we just have to go to our ‘riverfront propert y' with just the car. We think that will be a nice way to do it. Today, I personally have trouble seeing how anyone would want to buy any kind of RV without having what is called a ‘slide'. 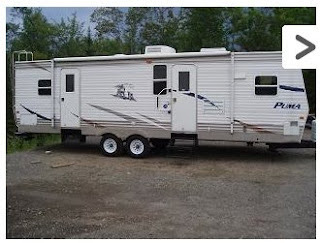 This is a movable portion of RV that is extended when the RV is parked and being lived in and un-extended when traveling. These slides add a tremendous amount of living space. Imaging that a slide is 12 feet long by 3 feet wide, it will add 36 square feet. When you have only 232 square feet (8 x 29) an extra 36 is significant. It also ‘opens up' the space so it seems very open and livable. The unit will put about 800 pounds onto the hitch (1/2 ton) but I wouldn't say a half ton pickup can handle it. You should figure about 7500 pounds when towing. Inside the unit, we have all the modern conveniences. Microwave, oven, refrigerator, running water and everything!! The difference between a house and an apartment and an RV is size. The biggest difference is really HOW you think more than anything. You never need be limited by any concept of ‘place'. You move your little house to where you want or need to be. My goal is to figure out HOW to make money (I'm not even close to retirement) without having to be connected to a physical place. Somehow I think the internet will help. I just don't know how. Well, this is a little about our RV. Send questions and I'll add to this post to include more interesting information.